Wouldn't it be great if your users had a way to "roll back time" when they forgot to think before they click on a bad link? Second Chance could one day be the difference between a ransomware infection and a free weekend. Give it a try! Requirements: Windows 7 (32 or 64 bit) and higher, all installed versions of Outlook 2007 and higher, .NET 4.0 or newer. Gmail and Office 365 web interfaces if the end user is using Internet Explorer 11 on Windows 7 or higher. 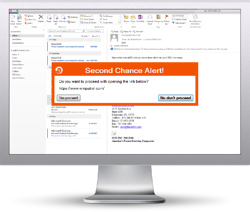 KnowBe4 is the world's largest integrated platform for awareness training combined with simulated phishing attacks. We help thousands of organizations to manage the continuing problem of social engineering.